Improving adolescents’ sexual and reproductive health, including preventing unintended pregnancy, is essential to their social and economic well-being. Nearly four-fifths of pregnancies among adolescents aged 15–19 in Latin America and the Caribbean are unintended,1 and about half of these end in abortion.2,3 More than three-quarters of these abortions are unsafe. Among the 27.5 million women aged 15–19 in Latin America and the Caribbean, 33% (9.0 million) need contraception because they are married, or are unmarried and sexually active, and do not want a child for at least two years. Of these 9.0 million adolescents, 62% (5.6 million) are using modern contraceptives. The most common methods are male condoms and the pill, followed by injectables. The other 38% (3.4 million) are not using a modern method; these adolescent women have an unmet need for modern contraception. The vast majority of these women are using no method at all, and the remainder use traditional methods, which are less effective than modern methods. 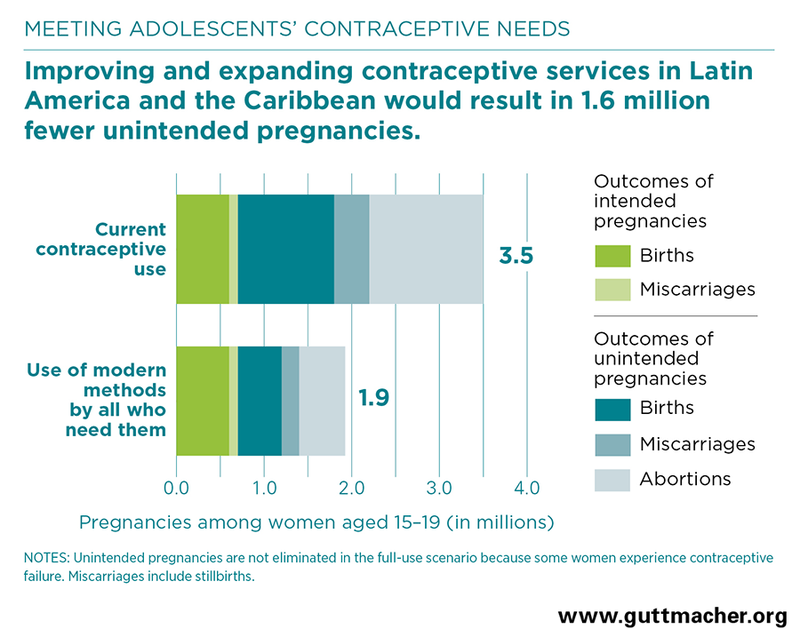 Among subregions, unmet need is highest in Central America, where 49% of sexually active adolescents who want to avoid pregnancy are not using modern contraceptives. This proportion is 40% in the Caribbean and 34% in South America. Based on 2017 estimates, the annual cost of providing contraceptive services to the 5.6 million women aged 15–19 who currently use modern contraceptives in Latin America and the Caribbean is $144 million. This averages to $26 per user annually. Service costs include direct costs for contraceptives, related supplies and health worker salaries, as well as the indirect costs of management functions, construction and maintenance of facilities, information and education activities and other types of program support. If services were improved for the 5.6 million adolescent women currently using modern contraceptives, costs would increase from $144 million to $153 million. Examples of improvements that would benefit adolescents include better contraceptive counseling and follow-up, consistent availability of a range of modern methods and providers who are trained to work with adolescents. If the 3.4 million adolescent women with unmet need were to use the same mix of modern methods as current users and receive improved services, total costs for current and new users would be $243 million each year, an increase of $99 million annually. The expanded and improved contraceptive services for all 9.0 million women who need them would cost $27 per user annually. Put differently, the annual cost per capita in Latin America and the Caribbean would be 38 cents. Increased use of modern contraceptives by adolescents wanting to avoid pregnancy would prevent unintended pregnancies, save lives and improve health. If all adolescent women who need modern contraceptives were to use them, unintended pregnancies would decrease by 1.6 million per year (58%), and total pregnancies would decrease from 3.5 million per year to 1.9 million per year. This would result in 631,000 fewer unplanned births; 781,000 fewer abortions, more than three-quarters of which would have been unsafe; and 204,000 fewer miscarriages and stillbirths from unintended pregnancies. Maternal deaths—those due to complications of pregnancy and childbearing—among women aged 15–19 would drop from the current level of 700 per year5 to 400. Meeting adolescent women’s contraceptive needs requires policies and practices to end child marriage, prevent sexual abuse and coercion, increase girls’ education, empower girls and women, and provide comprehensive sexuality education and high-quality contraceptive services. Engaging young men in sexual and reproductive health programs can help bring about more gender-equitable attitudes. Adolescents need access to medically accurate and complete sexual and reproductive health information before they are sexually active. This information should be age-, developmentally and culturally appropriate. Policies and programs, including comprehensive sexuality education, should be put in place that address this need. The counseling provided with contraceptive methods must be strengthened. All adolescents need correct information about the likelihood of pregnancy, choices of contraceptive methods, information about possible side effects, and support in switching methods when desired. Contraceptive services must be provided in a way that protects young women’s rights to voluntary, informed and confidential contraceptive choice. 1. Darroch JE et al., Adding It Up: Costs and Benefits of Meeting the Contraceptive Needs of Adolescents, New York: Guttmacher Institute, 2016, https://www.guttmacher.org/report/adding-it-meeting-contraceptive-needs-of-adolescents. 5. Institute for Health Metrics and Evaluation, Global Health Data Exchange: GBD results tools, Percent of total deaths from maternal disorders to females aged 15–19, 2016, and distribution of 2016 deaths from maternal disorders by cause of death, 15–19-year-old females, by country, 2016, http://ghdx.healthdata.org/gbd-results-tool. Unless otherwise indicated, the information in this fact sheet is based on special tabulations of data for Darroch JE et al., Adding it up: investing in contraception and maternal and newborn health, 2017, Fact Sheet, New York: Guttmacher Institute, 2017, https://www.guttmacher.org/fact-sheet/adding-it-up-contraception-mnh-2017. This fact sheet was made possible by support to the Guttmacher Institute, including UK Aid from the UK Government and grants from the Bill & Melinda Gates Foundation, the Dutch Ministry of Foreign Affairs and The Children’s Investment Fund Foundation. The views expressed are those of the authors and do not necessarily reflect the positions and policies of the donors.